Senior Emergency Medicine Resident Nadeem Modan, MD, received first place in the 2018 Annual Emergency Medicine Resident Day of Scholarship for his role in an ongoing global health project aimed towards expanding acute care availability in India. 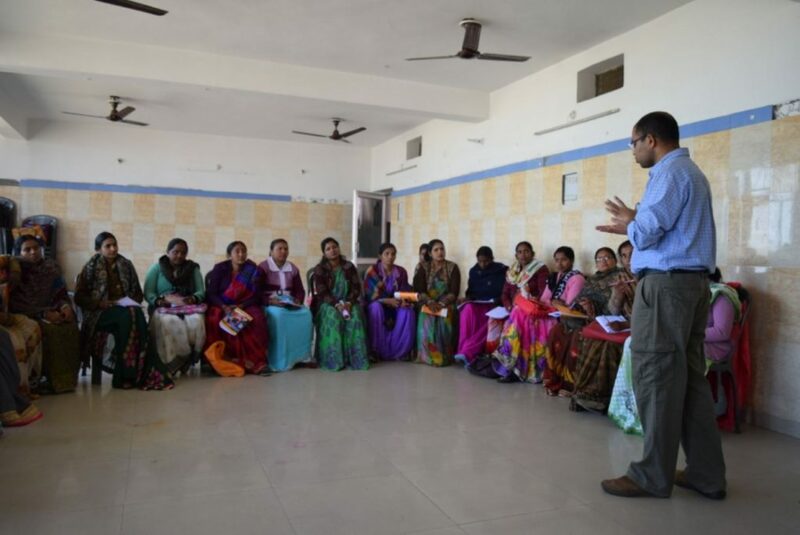 As a joint effort between UNC, Stanford University and Healing Fields Foundation, the Community Health Worker Project focuses on training local ASHAs to become practicing community health providers, as well as developing a larger medical network for hospital referrals throughout India. ASHAs, or Accredited Social Health Activists, are local women elected by their villages to serve the community as medical advisors. While recognized by the National Rural Health Ministry, ASHAs are restricted to providing educational services only, such as encouraging delivery at health centers and promoting immunizations. The project goal, led by Ayesha Khan, MD, of Stanford University, is to further train these already trusted educators to become basic care providers who can actually see patients and provide medical services for common acute diagnoses such as fever, cough, diarrhea and abdominal pains. Beyond this, it aims to create a medical network through which more severe cases may be referred to nearby clinics and hospitals. For every 1,000 patients in India, there are 0.7 doctors. Compare this to the 2.5 per thousand in United States and the enormous need of such a project becomes overwhelmingly clear. With over 860,000 ASHAs throughout the country, the process focuses on a trickle-down system of “Teachers training Teachers,” wherein the project leaders train instructors, who then train and test groups of ASHAs according to a module-based curriculum that Modan and his team have designed. Healing Hands Foundation, an all-volunteer nonprofit organization that specializes in areas lacking in medical resources, is primarily responsible for training the ASHAs, hiring staff, financing the project, and ultimately turning the ASHAs into community health workers. Meanwhile, Khan, Modan and their team provide the professional knowledge, background and expertise necessary to carry out the goals. At this time, Modan excitedly reports that there has already been measurable data and progress shown between the pre-test and post-test evaluations of the curriculum. ASHAs participating in the training have shown a significant increase in their reported confidence in providing acute care. While 39.6 percent of participants reported feeling “Not Confident” and none reported feeling “Completely Confident” prior to the training, 39 percent identified as “Completely Confident” with none selecting “Not Confident” once their training was complete. Still in its early stages, the regional focus is specifically on Northern India, where Modan says need is the highest, but he hopes to soon have a presence in every state of India. At this time, the project has 54 community health workers in practice, and about 25 people working on the project both on-site and from the US. On a local level, Modan has been working closely with the UNC School of Medicine’s Office of International Activities (OIA) throughout his residency. In 2015 he was selected to be a part of the OIA Global Health Scholars Program, through which he has received two years of funding for the project, as well as mentor support from Justin Myers, DO, MPH. In May of 2017, he presented his findings of medically underserved areas alongside fellow resident Serena Zhou-Talbert, MD, MPH, at the OIA’s monthly Global Health Forum. As far as Modan’s future is concerned, the senior resident plans to stay involved with this as well as other global health projects after graduation. He hopes to stay at UNC as adjunct faculty, and is eager to explore ways to stay further involved with the OIA as well.